Another year has come and gone! 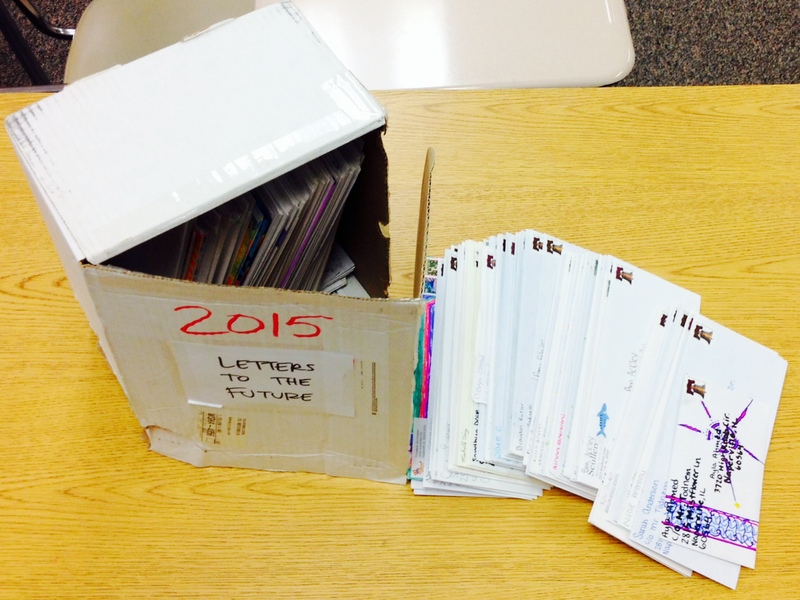 It’s time once again to mail off the Letters to the Future. To the Scullen graduates of 2011, which is this year’s high school graduating class of 2015, congratulations! With the past four years, I have seen the need for social media to play a role in my teaching, thus the emergence of this portion of my website and the incorporation of Facebook, Twitter, and now Instagram into my Health class content. Last year I wrote about the addition of this media, and at that point more and more feedback seemed to be that Twitter ruled social media for high schoolers. But in the last 12 months I’ve now seen Instagram surpass Twitter not only with Scullen alumni involvement, but in total users. With 300 million active accounts as of April 2015, Instagram includes many of my current middle school students as well. Rightfully so, I’ve jumped right in to use all three major platforms to spread both personal and public messages of physical, mental, and of course social health. In the meantime, the goal is that my profiles exist as a model for safe and appropriate use of social media. “This is the future of America,” I wrote last May. And so, I welcome the future of online and social media interactions with open arms. In personal news, I continue to write as well as teach. My love of writing was in bloom well before I thought I’d become a teacher, and I continue to challenge myself with monthly and weekly prompts to allow for personal creativity and provide an outlet for my many thoughts on life. This website now includes other writers besides myself, but this specific section remains dedicated to you, dear students of Health class past. And so I urge you, young readers, to do the same. To write for yourself. And to share with others that which you feel necessary. I did this for you in your 8th grade year; I required you to write to your future self. Ultimately some decided against it, and have nothing to be delivered in the mail this month, unfortunately. But if you’re reading this, and you’re one of the graduating alumni from the 2010-2011 Scullen school year, then well done. You did it! You wrote a letter to yourself, from your past, to your future. Not only that, you survived four years of high school, and that means you can do anything in life. There is a negative presence on social media, of course, but I encourage and challenge you to use whatever accounts you do have to post the opposite. Today, take the time to let me know you received your letter– send me a quick message, a picture, or anything you decide to let me know it has arrived. Use your favorite media outlet to connect on Twitter or Instagram or even Facebook if you are willing. Don’t worry, I don’t follow back. Your business is your business. See, sending these letters is kind of like letting a group of balloons go after holding them in your hands just seconds before. You wonder where they’ll end up. You wonder who will appreciate them. I never read anyone’s personal letter, but instead I hold the memories captive for a bit, only to let them settle in the back of your young minds… some things forgotten, others still alive with who you were just four short years ago. And then, off they go, spreading to the future, free to float in the wind– well, okay, enough with that analogy– they’re in the mail from the post office. Haha. So, class of 2015, since you wrote to yourself in 2010 or 2011 there are many things that haven’t changed. I continue to teach at Scullen Middle School in Naperville, Illinois, in the same classroom in which you sat back in 8th grade. Some assignments and activities stick around– Freaks & Geeks, Finding Forrester, Romeo + Juliet are all still in use. These are, in some ways, always pertinent… and in other ways they are running their course and will need to be replaced at some point with more current video clips to suit the ever-changing teenage life. However, there are plenty of other things that have in fact changed. The Scullen LMC looks quite different now, to accommodate an increasingly technological educational experience. My Health classroom has new posters and wall decorations, more laptop use, and other added experiments and activities that make sense for 2015. My Letters to the Future assignment is one of those items that seems to remain timeless. My social media pages are still young, but have been a nice addition with a modest but growing following. We’ll see where this all goes. The basic idea is to let life lessons live on for more than just 9 weeks, more than one school year, and more than three grades of middle school. I am reminded all the time that the ups and downs prove everything may be unpredictable, but that life is definitely worth living. I hope that your past four years have proven much of the same. Congratulations once again, and I hope your letter finds you well. Remember to connect to keep in touch, and to reminisce about life at age 13-14 compared to now. ← Fool Me Twice, Shame On Me: Do You Want To Go Get Ice Cream?